FlexXray has been protecting the food industry since 2001 when founder Don Forrest built the company’s first food product inspection system. After his initial customer — a bakery — needed help locating a bolt that had gone missing in some pies, Forrest launched the company’s reputation for speed, accuracy and innovation. A few things have changed since then, yet the company’s commitment to responsiveness and accuracy remains the same. 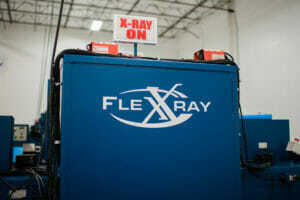 Today, FlexXray operates under CEO Kevin Fritzmeyer and is the leading X-ray inspection and recovery service for the food industry. Operations have expanded from that first X-ray food inspection machine to a 60,000-square-foot, temperature-controlled facility in Arlington, Texas, with an additional location in Connecticut. As a USDA- and FDA-registered inspection service, FlexXray has the solutions food processors and manufacturers need to keep your product — and your customers — safe. Because of a singular focus on inspection and recovery, FlexXray can offer a quick response to your foreign material problem. Our large capacity means that turning your product quickly is the standard, not the exception. FlexXray can even inspect a full truckload of product in as little as three to four hours while the driver waits. This specialized in-and-out service means that you’ll stay on schedule while ensuring that your product meets all the necessary safety standards. FlexXray’s advanced, medical grade X-ray systems can detect metal, glass particles, stone, bone, plastic, rubber gasket material, product clumps, container defects, wood and missing components 0.8 mm and smaller. This state-of-the-art equipment exceeds standards for food inspection machines found in food production plants. Our detailed traceability means that you can track the origin of physical contaminants, allowing you to make claims against vendors and prevent the contamination from occurring again. Unlike other third-party solutions, FlexXray can handle your frozen product, thanks to our temperature-controlled warehouse and refrigerated storage space. This minimizes the amount of time your product spends out of a temperature-controlled environment. In fact, about 70% of products inspected by FlexXray are frozen or chilled,and, for large orders, your product can even be divided to ensure its integrity is never compromised. FlexXray’s many solutions mean that you can choose the most convenient one for you. In addition to having locations in Texas and Connecticut, FlexXray provides a rental option that brings these top-of-the-line inspection capabilities directly to your production facility. With so many options, keeping your food product safe has never been simpler or more efficient. As part of its continued attention to excellence, in early 2018 FlexXray acquired Total Quality Corp., a top provider of inspections for food companies throughout the U.S. and Canada. With the acquisition of Total Quality Corp., FlexXray expanded operations to provide mobile product inspection that meets the company’s same standards of excellence. Now, FlexXray can inspect products on the line, which helps save companies from costly food production errors and recalls. The merger adds to FlexXray’s long history of successful inspection and customer growth, with several hundred customers benefiting from the advanced technology, industry experience and a complete dedication to ensuring the safest products possible. From small companies to major food producers, FlexXray’s approach and purpose remain the same: To provide reliable, state-of-the-art X-ray food inspections that will find issues before products go to market — and save clients millions of dollars every year.